After St. Patrick's Day, almost everyone has a lot of leftover corned beef. And, delicious as it is, you can't make Corned Beef Hash every day. 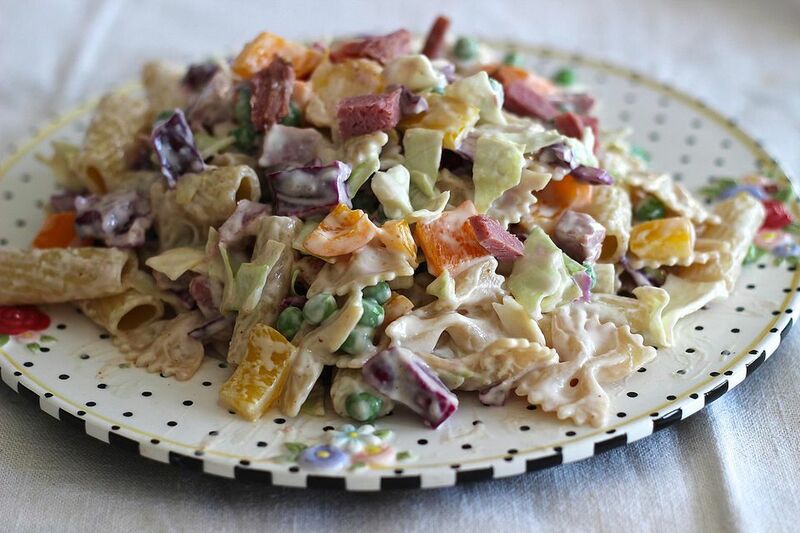 Corned beef cabbage and pasta salad is a wonderful way to celebrate St. Patrick's Day where you live if it's hot outside. It's also a wonderful way to use up leftovers. The salad is crunchy and sweet and savory and salty all at once. You don't need to serve anything else with this salad; it's a complete meal in one bowl. Bring a large pot of salted water to a boil. Add the pasta and cook until al dente, which means the pasta is tender but still has a slight bite in the center. The only way to tell if the pasta is cooked properly is to taste it. Put the peas in a colander in the sink and drain the pasta over them. While the pasta is cooking, in a large bowl combine the mayonnaise, yogurt, honey mustard, and lemon juice and mix well with a wire whisk. Stir in the drained pasta along with the cabbage, bell peppers, and frozen peas..
Stir gently to coat, then cover and chill for 2 to 3 hours in the refrigerator before serving. Store the leftovers, covered, in the fridge for three to four days, if it lasts that long!